BANGKOK, Thailand (CNN) -- An Australian author was sentenced Monday to three years in prison in Thailand after falling foul of a Thai law that makes it a crime to insult the country's royal family. Harry Nicolaides was arrested last August over a 2005 book called "Verisimilitude," which includes a paragraph about the king and crown prince that the authorities deemed a violation of the Lese Majeste law. Nicolaides, 41, was bombarded with questions from foreign journalists as he arrived at the court Monday, wearing shackles as he stepped from a prison bus. In tears, he said he would plead guilty. The Thai Criminal Court originally sentenced Nicolaides to six years in jail but cut the punishment in half because of the guilty plea. He listened calmly as the verdict was translated to him. One of his lawyers said no decision had been made about whether to appeal or seek a royal pardon. King Bhumibol Adulydej has pardoned foreigners in other similar cases in the past. He was about to leave Thailand when he was arrested on August 31 last year. It is not clear why the authorities waited three years after the publication of his book to bring charges against him. "I think there are individuals who have exploited an obscure law for their own self-interest," he said. Only 50 copies of the book were published, and only seven were sold. 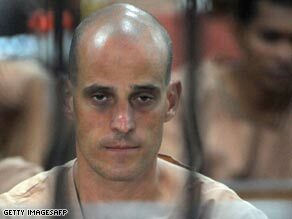 The law Nicolaides was convicted of breaking is section 112, known as the Lese Majeste law. It says: "Whoever defames, insults or threatens the King, the Queen, the Heir-apparent or the Regent, shall be punished with imprisonment of three to fifteen years." Thailand's king is highly revered in this Buddhist nation, but even he has said in the past that he can be criticized. Thailand's new prime minister, Abhisit Vejjajiva, also told CNN he is concerned about the misuse of the Lese Majeste law. "There are cases in the past where this law has been abused for political purposes, and I agree this has to stop," he said. Despite the rhetoric there's little sign the prime minister will change the law. Other cases are pending against both foreigners and Thais.